Background and Objectives: The combination of nano-metals and antibacterial agents could improve the efficacy of antibiotics against pathogens. This study suggested a combination method for increasing the antibacterial and anti-biofilm activity of ampicillin and gentamicin using iron oxide nanoparticles. Method: The synthesis of lipoamino acid-coated IONs (LION14) was done by co-precipitation method. The LION14s were characterized by several techniques. The antimicrobial and biofilm inhibitory activities of nanoparticles at three-time intervals were investigated alone and in combination with ampicillin and gentamicin against Staphylococcus aureus and Escherichia coli. In-vitro cytotoxicity assay was performed to assess potential toxic effects of LION14 on mammalian cell line. Results: Detailed characterization of the LION14 confirmed the presence of about 7 nm sized magnetic nanoparticles coated with lipo-amino acid. 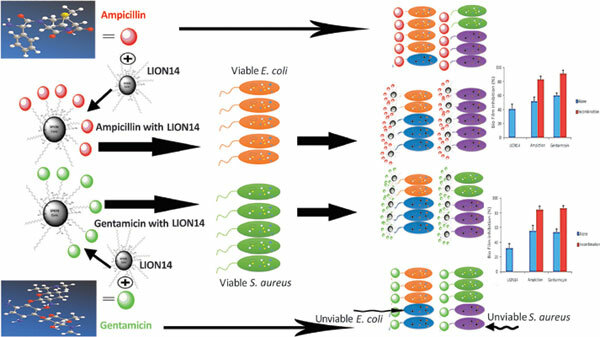 The antimicrobial and biofilm inhibitory effects of ampicillin and gentamicin were increased in the presence of the appropriate concentration of LION14s against tested microorganisms. The highest synergistic effect was observed for ampicillin against Escherichia coli. Also in the presence of antibiotics, the antibacterial and biofilm inhibitory effect of LION14 was significantly increased. The cytotoxicity results of LION14 showed the minimum cytotoxicity on the L929 cell line. Conclusion: The result showed that the combination of antibiotics with LION14 provides enhanced antimicrobial and anti-biofilm results for antibiotics along with acceptable biocompatibility. This synergistic effect could be used against biofilm forming bacteria and resistant microorganisms in the future. Antibiotics, antimicrobial activity, combination effect, lipo-amino acid, super-paramagnetic iron oxide nanoparticles, synergistic effect.